Manipur – the land of jewels. The north eastern state which is today more famous for the Olympian champion Mary Kom is trying to create awareness about it as a preferred destination for tourism. The state has been the center of rich culture and is blessed with moderate climate but unfortunately it has not been so popular due to the sensitivity of its location. However, there has been a growing effort from the state government on building the state tourism and the recent one can be seen in the form of promoting the Manipur Sangai Festival, 2012. The state has also chosen the social way to create awareness and is building an active social media presence on Facebook. The state tourism department that has built a decent presence on Facebook for the outreach, has two different pages under its belt – 1) Tourism Department Manipur page and 2) Manipur Sangai Festival. The Tourism Department Manipur page which has built a fan base of more than 1300 fans is majorly concentrating right now in creating a buzz for the Manipur Sangai Festival. The content that is being shared is all about the Sangai Festival that would be hosted from 21st-30th November, 2012. And the responses have been pouring in by fellow Manipuris supporting this move from their state. State governments promoting tourism is not a unique initiative but always a welcome change. In the past, we have seen states such as Chhattisgarh doing the same. However the challenge is to carry this initiative on an ongoing basis so that fans see the intent, gradually start being a part of the community and later on become the ambassadors. 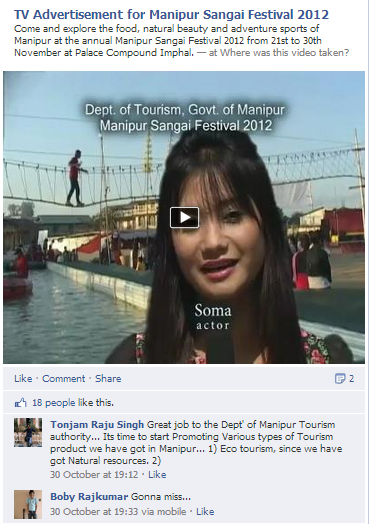 For now it is a much required effort from the Manipur Tourism Department. Kudos to them!